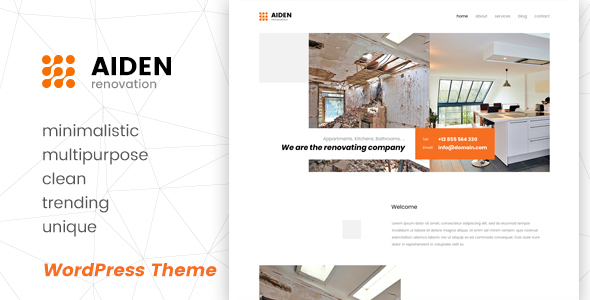 AIDEN is WordPress theme for renovating company or individuals. Present your work in easy way so that visitors see your amazing work. Theme is SEO friendly and optimised (images,script files, ..), which is good for browsers and theme speed. It is also responsive so it suits to all devices (mobile, tablets,…). With Aiden you get an outstanding WordPress theme, with really amazing documentation. Minimalistic and clean design is main reason that Aiden Minimalistic Multipurpose WordPress Theme is great for everyone that is looking for small theme with features that are important. Minimalistic Multipurpose WordPress Theme is Responsive. This means that it is perfect displayed on every smart device (phones, tablets, computers). We have set the layout so that it looks optimal for each section on each device. This lets you get the most of the view on any resolution. Slider is unique and easy to create it. Just upload images, write your main and phone number. And your customers will find your information in a second. Overall design is minimalistic because we wanted that kind of theme for business that do not need multiple options and pages. All pages are custom built with custom templates. So that is really easy to set any page and add images or text. Theme Options are easy to use. Change colors, logo, fonts, images and other stuff on a really easy way. We do not have alot of options like some other themes when you lost in theme options, but we have options that are effective and that customer can change site to unique design. You want to write blog news about you or your company? Then you should see this simple blog. Just add it and start writing some news. Demo importer settings: One-click demo install. General settings: main color, second color, background, captions, favicon, additional CSS,..